Home > News > Sportsmanship Matters > Brookfield East Volleyball Coach says Sportsmanship Award is a huge honor! Brookfield East Volleyball Coach says Sportsmanship Award is a huge honor! 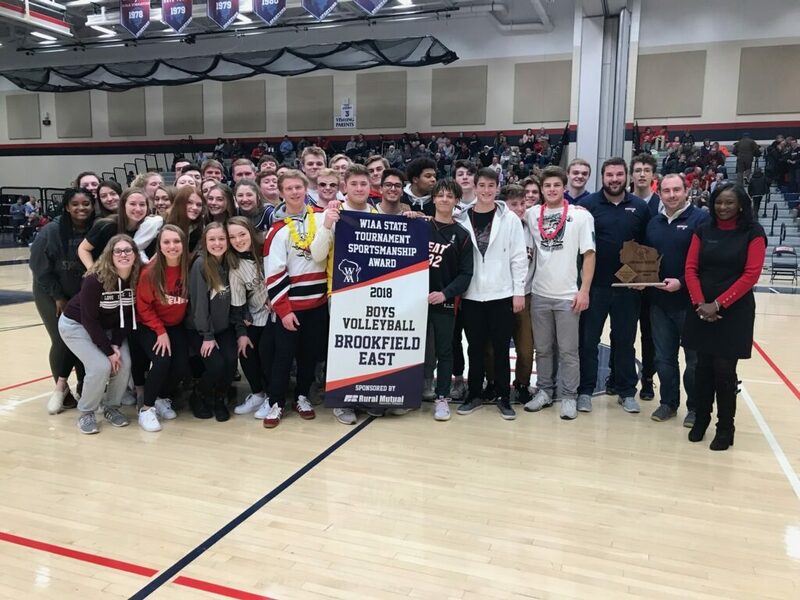 We would like to congratulate the Brookfield East on being this year’s recipient of the Boys Volleyball Sportsmanship award this past fall. This is the second time Brookfield East is the recipient of the WIAA/Rural Mutual Insurance Sportsmanship Award. They also won the award in 2013 for Boys Volleyball. Sportsmanship is extremely important as a coach and I stress this to our boys every season and every game. This award is like making it to state, a huge honor. As a coach we try to not only develop players, but prepare them for the real world. They may only play a few years of athletics or some may go onto play in college etc. However, sportsmanship, teamwork, work ethic and leadership are all things we strive to instill on the boys as those are things that they can carry with them for a lifetime. As a team, we know that we will win and lose as far as the score goes. However, as a team and representatives of Brookfield East we always strive to have exemplary sportsmanship. The boys in our program get that and know how important it is to us as coaches and how sportsmanship is something that they will carry though life. Winning the WIAA/Rural Mutual Sportsmanship award says a lot about our community and School. I think it’s a testament to the wonderful students we have but also the amazing faculty and coaches at Brookfield East that we have such wonderful student athletes that we can all be so proud of both on and off the court. Coach Nosbusch has been coaching for 18 year. He has been involved in coaching from the grade school, club and high school levels. His favorite part of coaching is seeing kids and teams accomplish their goals from hard work and determination. Seeing them not only excel on the court but off the court. He also enjoys staying in touch with these young men after they go off to college, graduate from college and get into their profession. Even when Nosbusch coached grade school volleyball, he was grateful to see his players go off to high school and knowing that he may have had even a small hand in them achieving their goals and becoming the person they are today. Coach Nosbusch knows the wins and losses will be remembered for a season. However, the impact he has on the development of a young man or woman into the adulthood will last a lifetime. Congratulations again on a great season and a great achievement for the Brookfield East community!